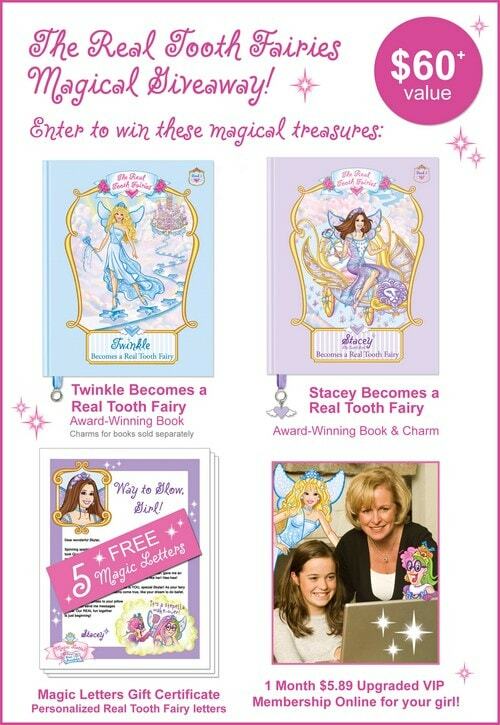 There’s a great new interactive website and storybook series for young girls called The Real Tooth Fairies! Like it was yesterday, I’m sure you remember the excitement of losing a tooth and the anticipation of placing it under the pillow as you slept, anxious to awake to a magical surprise. But the story of the tooth fairy has never truly been told… until now! The Real Tooth Fairies is a place where love is magic, and every kindness counts, and I would love to share with you additional details about the properties and how it can offer children, not only a foundational experience with their own personal tooth fairy but also tools for effective character building and shared values. Click here to leave your email address on my contest entry form. Become a fan of LAB’s Facebook Page.Then leave a comment on the wall saying why you love the Real Tooth Fairies Magical giveaway. Comment on posts other than this one – Be sure to add that the comment is acting as an entry to the contest. Each comment counts as one entry. Please be sure to include you email when asked otherwise I won’t be able to contact you. I saw this on face book so here I am commenting 🙂 Good morning sweet Vera! Looks like fun for the kids. Enjoy! this looks cute…my kids are very anxious for their teeth to fall out!